How do negative interest rates work anyway? Editor’s Note: In Frankfurt today, the European Central Bank launched another stimulus package that expands quantitative easing and lowers its deposit interest rate further — from negative 0.3 percent to negative 0.4 percent. The ECB is one of several central banks that have looked to boost consumption and growth via negative interest rates, which in turn, it hopes will spur inflation. Below, El-Erian explains the theory behind negative interest rates, why central banks have taken this drastic step and how negative interest rates play out in practice, including the risks. For more on the topic of low interest rates in the United States, tune in to tonight’s Making Sen$e report, which airs every Thursday on the PBS NewsHour. The following text has been edited for clarity and length. Mohamed El-Erian: If we were in Europe, we would ask: How long can interest rates stay negative? Think about this. Not only are you lending your money to governments, but you’re paying them interest for the privilege of doing so. Paul Solman: Because when you buy a bond, you are basically just lending money to the government, and the government bond in Europe now is paying less than the rate of inflation? Mohamed El-Erian: It’s paying negative in nominal terms too! So it means that at the end of the day when you get back the money you have lent, it’s less than what you paid out. Now, we normally think if you’re going to lend someone money, you should get some reward for doing this. In Europe, it’s a tax! I remember when I was growing up, you would go to a bank to open a deposit, and they’d give you a toaster. A free toaster. These days, if you’re a company, and you go to a bank, they could easily turn you away! They don’t want your deposits anymore. Paul Solman: Why? What’s going on? Mohamed El-Erian: So the simple answer is that our political process has basically sidelined most of our economic instruments. So the one instrument that has relative political autonomy is monetary policy. Central banks do not need to go to Congress to get approval for an interest rate hike. Paul Solman: When you’re talking about the usual economic instruments, you’re talking about infrastructure spending, for example? Paul Solman: But active fiscal policy is spending money? 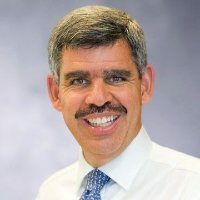 Mohamed El-Erian: It is making decisions as to how you want to spend money and who you want to tax. We’ve had this ridiculous situation in the United States that for five years, Congress could not agree on an active budget. So we rolled over what we’ve had before. But the world changes! So we’re in a situation today where the only policymakers that have flexibility are central banks. But they don’t have the instruments! So they’ve had to experiment, and the more you experiment, the more uncertainty and the higher the risk of collateral damage. Paul Solman: But how are negative interest rates supposed to work? Mohamed El-Erian: Correct. The idea is to push households and push companies to take on more risk. In one case, financial risk — the stock market — in the other case, economic risk. Economic risk is investing in, say, plants and equipment. So let’s look at the first one. You take financial risk, you push up the price of stocks. Paul Solman: Of which has certainly happened. Mohamed El-Erian: Which has happened. You and I then open a 401(k), and we say, “Wow, we’re richer!” In theory, we trigger what economics call the wealth effect. Because we feel we’re wealthier, we go out and spend more. And then the third element is that if you happen to be the only one with negative interest rates, you also weaken your currency, which means you make your exports more competitive. Paul Solman: Because people don’t want to buy your bonds, they don’t have a demand for your currency? Mohamed El-Erian: Correct. So the theory is you trigger the wealth effect with consumers. They spend more. You trigger animal spirits with companies. They invest more. Paul Solman: Optimism. Spontaneous optimism. Mohamed El-Erian: Yes. And you also trigger exports by depreciating your currency. And lo and behold, the fundamentals start improving, and they validate the higher asset prices. Paul Solman: And for the exports, if your currency is cheaper, the stuff that’s priced in your currency is cheaper. Therefore, people want to buy your country’s goods and services. Mohamed El-Erian: And more people will come visit that country, because it will be a cheaper destination than elsewhere. That’s all of the theory. So households and especially companies have been cautious. And as a result, central banks have found that the economic response has consistently fallen short of their expectations. Paul Solman: And so the animal spirits, the attempt to stoke optimism, just hasn’t worked? And as long as decent economic policy in Washington is sidelined, companies are very cautious. Now, if you go to Japan, they’re willing to continue to give you central bank medication, but they’re scared because it’s less effective. 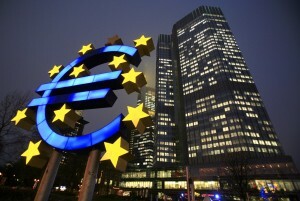 Japan followed the European Central Bank and surprised everybody by taking their policy rates negative. They expected that by taking their policy rates negative, the currency would weaken, helping the export sector, and their stock market would go up, helping sentiment. The exact opposite happened. They moved into negative territory, their currency strengthened, not weakened, and the stock market sold off, not rallied. For them, that’s an issue of effectiveness. Paul Solman: And they feel the pressure of lower interest rates being all they’ve got to keep their countries juiced? Paul Solman: We don’t know if they stimulate people to invest, or if they scare people half to death! Mohamed El-Erian: Correct. And then markets are saying, “Hey, wait a minute. I never thought it was going to get this bad. I never thought that I would rely on a medicine — interest rates — that would become so absurd!” So markets are much more nervous and much more volatile.